Political independence for the island of Taiwan has been a long-smoldering controversy. Recently “President” Chen Shui-bian deliberately fanned the issue, causing it to burst into flames. Halfway into his illegal and illegitimate “second term,” Chen’s approval ratings had fallen to an a mere 10% according to most public opinion polls, and as low as 5% according to one poll. Chen desperately needed to divert public attention from his administration’s rampant corruption and to consolidate support for himself among Taiwan independence hardliners. Therefore on January 29, 2006, Chinese New Year, Chen deliberately and maliciously dropped a political bombshell, by announcing that he was contemplating abolishing the National Unfiication Council and the National Unification Guidelines. Chen’s ploy worked, like a charm. With the notable exception of the popular TV talk show “21:00, The People Speak,” whose panelists refused to be diverted from their ongoing investigation into ruling DPP malfeasance, most of the media began talking about Taiwan independence vs. Chinese reunification. Few in the media talked about the Kaohsiung Mass Rapid Transit (KMRT) scandal and other outrageous ruling DPP regime scandals. The short answer is no, absolutely not. Taiwan independence, as even Chen Shui-bian himself conceded in a moment of rare honesty, is “self-delusion [and] a myth.” Taiwan independence is not a real world option by any criterion one cares to contemplate. Taiwan independence is neither constitutionally permissible, nor politically practicable, nor culturally justifiable, nor economically profitable. Taiwan independence is a non-starter, any way one looks at it. Given this harsh reality, one would think that Pan Blue political leaders would have an easy time rebutting the ridiculous claims of Pan Green demagogues. One would think that demolishing Pan Green arguments for Taiwan independence would be like shooting fish in a barrel. Kuomintang (KMT) leader Ma Ying-jeou and other officials yesterday scrambled to clarify an advertisement published by the party suggesting the KMT viewed independence for Taiwan as a possible option. In a front page advertisement in the independence-leaning Liberty Times the KMT’s central headquarters published an ad touting democracy as a means of determining the island’s future and listing independence as an option. “The Chinese KMT firmly believes in the spirit of democracy that there are many possible options for Taiwan’s future. The people should decide on these options, regardless of whether it is unification, independence or maintaining the status quo,” the advertisement said. Listing independence as an option for the island’s future would run counter to the KMT’s official charter and platform, which advocates eventual unification with the mainland. The advertisement was dubbed by local media yesterday as an enormous policy turnaround for Taiwan’s largest opposition party. Despite hasty damage control clarifying the “independence is an option” issue as a misunderstanding, KMT Chairman Ma Ying-jeou has already suffered political damage that he, the Pan Blue parties, and the Republic of China can ill afford. A February 16, 2006 ERA TV opinion poll revealed that 36.6% of the public believes that Ma’s current position on reunification and independence is either “very different” or “slightly different” from what it was before the advertisement ran. Considering that Ma’s approval rating stood at 80% following the December 2005 County and Municipal Elections, the perception that Ma’s position now is either “very different” or “slightly different” can hardly be considered a positive development. Lien Chan’s retirement from the political stage leaves Ma Ying-jeou as the sole remaining Pan Blue leader in a position to rescue the island from Taiwan independence Quisling misrule. A Pan Blue loss in 2008 is not an option. Four more years of Pan Green “wen hua tai du” (culturally-oriented Taiwan independence) indoctrination is a prospect too appalling to contemplate. That is why public relations disasters such as the “independence is an option” fiasco must never happen again. How did this “independence is an option” fiasco happen? More importantly, why did it happen? Most importantly, how can it be prevented from happening ever again? This and other similar fiascoes happened because too many Pan Blue leaders feel morally disarmed in the face of Pan Green Political Correctness. They feel morally disarmed, despite the fact that they are in the right and their Pan Green adversaries are in the wrong, because they lack confidence in their own “zhong ji tong yi” (Eventual Reunification) political ideal. As a result, Pan Green assertions of the “Right of Self-Determination” appear as sacred cows to which they must meekly yield the right of way. Pan Blue leaders must take the time to understand the merits and demerits of Pan Blue and Pan Green ideology, inside out, backwards and forwards. Only then will Pan Blue leaders be able to look Pan Green adversaries straight in the eye, confident in the knowledge that they, not their adversaries, occupy the moral as well as legal high ground. Pan Blue leaders must satisfy themselves that Eventual Reunification within the framework of Constitutionalism and the Rule of Law, soundly trumps petty ethnic Hoklo Fascist “nation-building” in accordance with the Rule of the Mob. Only then will Pan Blue leaders realize that they need not, nay, must not, make timid concessions to Pan Green Political Correctness. Does the “Right of Self-Determination” confer legal, and more importantly, moral legitimacy on the secessionist demands of Taiwan independence Quislings? Does the “Right of Self-Determination” leave Pan Blue leaders who insist on Eventual Reunification in accordance with Constitutionalism and the Rule of Law with no leg to stand on? Hardly. The “Right of Self-Determination” is a double-edged sword, an extremely sharp sword that cuts both ways. If Taiwan independence Quislings expect others to honor their demands for political secession from China, then they are obligated to honor others’ demands for political secession from any “Nation of Taiwan” they might succeed in founding. If Taiwan independence Quislings refuse to honor others’ demands for political secession from any “Nation of Taiwan” they might succeed in founding, then others are not obligated to honor their demands for political secession from China. The Republic of Singapore is a sovereign and independent nation, and a member of the United Nations. With a population of just over 4 million, three-fourths of whom are ethnic Chinese, Singapore is a mere fifth the size of the Taiwan region of China, with a population just under 23 million. Using Singapore as a hypothetical standard, one could form five independent nations from the population of Taiwan. The Republic of Nauru, a tiny island in the remote South Pacific, is also a sovereign and independent nation, also a member of the United Nations. With a population of 13,000 and a land area of 21 square kilometers, Nauru is the smallest nation on earth, in both population and land area. Using Nauru as a hypothetical standard, one could form nearly 1,800 [ ! ] independent republics from the population of Taiwan. Principled and consistent application of the “Right of Self-Determination” would legitimize the secession of ever smaller political entities from whatever larger political entity they currently belong to, stopping only at the level of the individual. Principled and consistent application of the “Right of Self-Determination” would authorize every property owner on earth to hold a referendum, with himself as the sole voter, declare his own private plot of land a sovereign republic, and refuse to pay taxes to the nation, the state or province, the city or county in which he (formerly) resided. 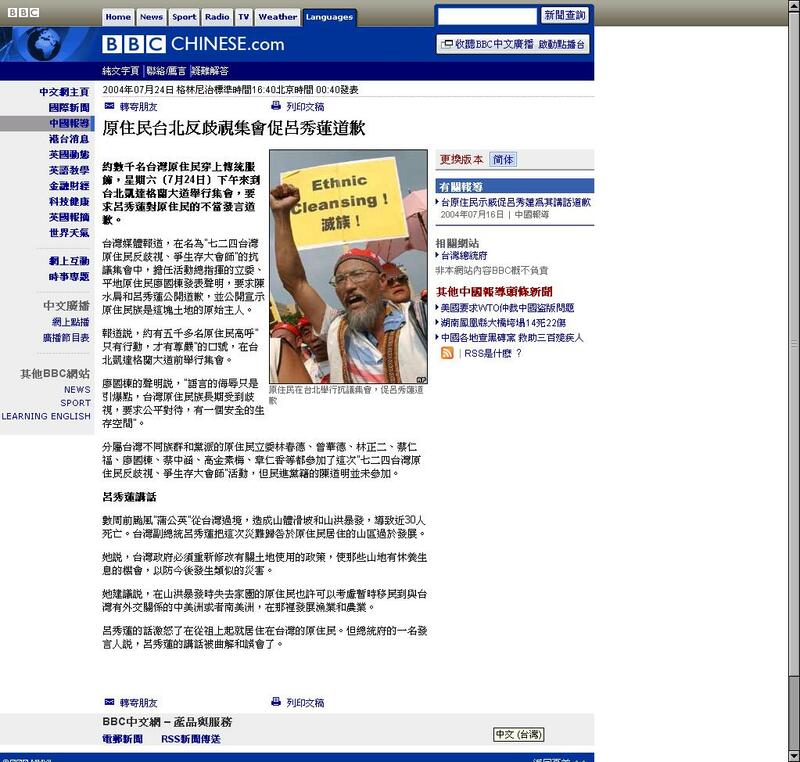 During the bitter post election protests in 2004, many Pan Blue protestors suggested that rather than suffer passively as Pan Green Quislings engaged in creeping secession from China, the Pan Blue democratic majority on Taiwan ought to seize the initiative and declare an independent loyalist Chinese republic in the northern half of the island, confirm Lien Chan as Pan Blue president, pay taxes to Pan Blue officials, and leave Taiwan independence Quislings in the south to starve themselves to death with their economically suicidal protectionist policies. As a champion of “market anarchism” aka “anarcho-capitalism,” I am willing to accept the natural outcome of principled and consistent application of the “Right of Self-Determination.” In fact, I welcome it. Are they willing to honor demands for political independence from any would be “Republic of Taiwan” they might succeed in establishing? Is anyone obligated to honor their self-righteous, unilateral demands for political independence from China? Taiwan independence Quislings are self-centered narcissists who demand independence for themselves, but refuse to allow independence for others. I made this point in my column seven years ago, in 1999. At the time I was merely making a logical inference. Now I am citing an established fact. TAIPEI – President Chen Shui-bian, widely believed to want independence for Taiwan, has, ironically, denied the same to a group who are the original Taiwanese – the aborigines. His government, on learning that hundreds of them have formed their own “Kaosha Republic,” ordered a crackdown, sending in 500 armed police to disperse them from a site they have claimed as the seat of their republic. The police raided the 6ha site in southern Kaohsiung county early yesterday, ordering the inhabitants to evacuate before four bulldozers tore down the more than 270 illegal structures. The residents claimed they had been tricked by Chen aides, who had told them that if they supported his re-election, their “republic” would be legalised … “A-Bian told us he would establish ‘country within country’ relations with the aborigines if we voted for him,” said Mr Tang Chao-cheng, a self-proclaimed “Speaker” of the “Taiwan People Parliament.” [The] Kaosha Republic… had its own flag and anthem, and a temporary government and parliament. One of the most frequently heard complaints from Taiwan independence Quislings is that authorities on the Chinese mainland refuse to refrain from using force to forstall Taiwan independence. This is perfectly true. But so what? Ruling DPP regime behavior while suppressing Kaosha Republic independence demonstrated that Taiwan independence Quislings had no qualms whatsoever about using force to prevent Taiwan’s Aborigines from seceding from their Hoklo Chauvinist “Republic of Taiwan.” Not a single Pan Green champion of independence for Taiwan raised his voice in protest when their Fuhrer Chen Shui-bian ordered stormtroopers and bulldozers to forestall independence from Taiwan. Not one. Nor did a single Pan Green champion of “Taiwan’s Right of Self-Determination” raise his voice in protest when their Vice-fuhrer Annette Lu scapegoated Taiwan’s Aborigines, blaming them for overdevelopment, deforestation, soil erosion, and flooding in Taiwan’s central mountain range. Aboriginal victims of Tropical Storm Mindulle, Lu declared, deserved no sympathy. They should be relocated en masse to Central and South America for damaging Taiwan’s ecology. The island should be left in the hands of those whom Taiwan independence fascists designate as “real Taiwanese,” i.e., themselves. What right do they have to complain when Pan Blue leaders insist on defending the national sovereignty and territorial integrity of the Republic of China, the first and oldest republic in Asia, one that has been in continuous existence since 1912, and whose constitution was modeled on the Constitution of the United States of America? For that matter, what right to they have to complain when mainland Chinese authorities pass an “Anti-Secession Law” defending the national sovereignty and territorial integrity of China against undisguised Japanese Neocolonialism? As the Britannica.com entry made abundantly clear, moral judgments must be universalizable. The same judgment must be made in all conceivable cases. The same prescription has to be made in all hypothetically as well as actually similar cases. If, on the other hand, the nations of the world wish to abide by traditional rules governing national sovereignty and territorial integrity, then patriotic Chinese on Taiwan and the Chinese mainland are fully within their rights to insist that Taiwan independence is not an option, that Taiwan independence Quislings have no right to demand secession from China, and that the nations of the world must respect China’s national sovereignty and territorial integrity. Pan Blue leaders can and ought to look Pan Green adversaries straight in the eye, confident in the knowledge that they, not their Pan Green adversaries, occupy the moral as well as legal high ground. Eventual Reunification within the Rule of Law framework of a long-established constitutional republic soundly trumps race-based Hoklo Fascist “nation-building” on the basis of “democratic” Mob Rule. Not only do Pan Blue leaders have no obligation to make pusillanimous concessions to Pan Green Political Correctness, they have a solemn obligation to seize the initiative and thoroughly discredit Pan Green ethnic bigotry.